With The Hobbit film coming out in a few months (I think), I figured now would be a good time to read it. My brothers and I used to love to watch the cartoon movie of it. To this day, the goblin song might still be my favorite song of all time. Plus the whole thing, especially Gollum scared me like few things in life ever did. The book was pretty good, luckily I’d forgotten enough since I was a kid that not everything was predictable. For some reason I expected it to be less kiddie as I began reading, but it was written for children after all, so I don’t know how I got that expectation. I’d say that this did hold up to my lofty childhood expectations. 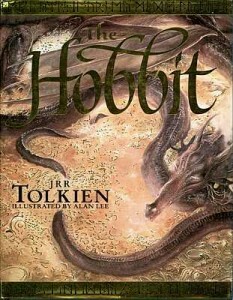 I found myself rooting for that little hobbit on his epic journey. Glad I gave this one a shot, now I have the goblin song stuck in my head again. Finally found some electricity at work today, so I figured I’d jot down some of my highlights from the most craziest storm I’ve been witnessed. While the storm only lasted about 45 minutes or so on Friday night, the insane wind gusts sure left their mark. I knew that I’d wake up to some decent amount of damage in the neighborhood, but nothing near what took place around Linwood. Massive oaks that I thought were unmovable were lifted taking up chunks of sidewalks with them. I honestly felt that the Hulk would’ve broken a sweat attempting to lift many of these ancient oaks. I still can’t believe how many had gotten torn up or broken. Sadly what would break their fall in most cases were power lines. So there were many downed power lines throughout. In fact as of right now there’s still no power in Linwood and it isn’t expect back on until July 6th. Hopefully it comes back much sooner if possible. I was without cell service for a while too. On my quest to get a car charger for my phone I wound up at a Radio Shack. I hate Radio Shack. The salesman was pretty insistant on selling me insurance on my $30 purchase. Why would I spend $11 to insure something that was $30? With all the craziness about, I think Radio Shack may’ve been the zaniest experience I had. Not having power hasn’t been that bad though. In a weird way it’s a bit refreshing to be without it. I feel a bit less lazy since I’m not sitting around as much. Though air conditioning is quite nice to have especially when you’ve been outside moving trees and other storm clean up stuff. This was the most damage I’ve seen in the area ever. Still a bit amazed at all the trees that came down, many of them will be sadly missed. I assist at work with handling our social media presences. Of which we do get the occasional upset and or nasty comment. Today I do believe I just coined the Triple AAA Approach to handling negative social media postings. Acknowledge – this that you the person’s comment has been heard. This is very important and the sooner it can be done the better! Simply acknowledging the problem/complaint can on it’s own solve many problems. Apologize – I don’t care how right you may feel you or your organization is, apologize for what occurred. Again, this can and should be done in a very timely manner. Often somebody just want’s to hear an apology and isn’t necessarily looking for a resolution. Answer/Assist – this is the last step. Get them help or answer what their problem or issue was. Sometimes this can take time, and in that case the first two steps can be taken in the meantime to hold them over and let them know that you are actively working to assist them. That’s it for my Triple AAA Approach to social media customer service. I always hear much debate over the flaws of the US Healthcare Industry. Well today, I experienced just how awesome it can be. I’ve unfortunately been sick, very sick for a very long time. For a week or so I was being falsely treated for strep throat. Not exactly sure when it started, I’m kinda old fashioned and if something hurts you just work through it, so there’s really no telling when this all began. At 10:15 AM made an appointment to see my regular physician at 11:45 AM. Was promptly seem by my physician with a minimal of wait. Was recommended I see a ear, nose and throat specialist. They set up the appointment for me, same day at 2:00 PM. I also had bloodwork and a chest x-ray setup for me on a walk-in basis, as well as 2 prescriptions made out as well. Cost: $10 co-pay. 12:20 PM pick up my 2 prescriptions from CVS, then go home and load up on as much fluids as possible. Cost: $6. 1:50 arrive at the ear, nose and throat doctor. His specialization seems to of paid off in spades with the then mystery of my condition. We agree to take a gamble and he administers a cortisone shot. I do believe there’s enough cortisone in my arm to allow Jamie Moyer to throw a 90+ MPH fastball. I also am written up a prescription that is sent to CVS for me. Cost: $10 co-pay. 2:30 arrive to get blood work done. It’s amazing how fast the effects of that shot is kicking it, thus far our educated gamble seems to be paying off (thank God, side effects sounded bad). A simple prick in my arm and 2 vials are filled. Cost: $10 co-pay. 3:00 arrive get a chest x-ray performed. No appointment, I’m in and out in under 20 minutes. Cost: $10 co-pay. 3:30 arrive at CVS (again!) and pick up my prescription that’s waiting for me. $3. For a total of $49 and never having to drive more than 7 minutes for any location (that’s with summer traffic mind you), I was able to get incredible health service today! I was so very impressed and so very glad to have solid health insurance as well. 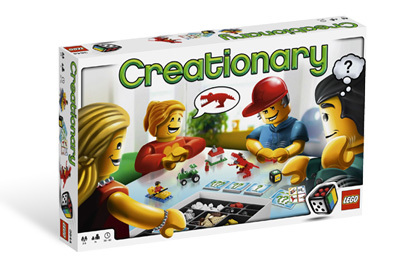 I had to exchange a birthday gift this week and decided to use my newly found store credit on the Creationary Lego board game. I’ve always been a big fan of Legos, in fact my dream job as a child growing up was to be a Lego designer. Apparently Lego has a full line of board games now, but Creationary was the one that really caught my eye. It’s like Pictionary but instead of drawing the things to guess, you build them with Lego bricks. A simple, yet brilliant concept. You also know something is good when you can get people who’d never participate in a board game to play it too. Some of the cards are pretty challenging actually, but there’s 3 levels of difficulty that you can choose which helps even things out amongst different skilled players/teams. I’m very pleased with this fine purchase and have to highly recommend this as a fine game to play with a group of people. Plus you get to build with Legos which is always a good thing. Friday was my birthday and I just wanted to point out and thank all the people who were kind enough to make it such a fine day. Actually I pretty much could change my birthday into birthday week the way ti’s turned out. Monday started off with a surprise Grow! Nyokki! Monkey on my desk. It’s really awesome and I can’t wait to grow it by my window. It’s so very cool. I also got some Dwight Schrute stationary so that I can easily keep track of time wasters, excuses and complaints. It’s pretty funny stuff. It came with an The Office notebook and some of the heaviest crayola pens I’ve ever picked up. They’re seriously heavy. Lunch Club got me a Star Wars Science Dagobah Frog Habitat. It’s amazing, it’s a scene of Dagoba with Yoda and you grow tadpoles into frogs with it. I can’t wait to start! I have to order the tadpoles in the mail, so will have to exercise great patience (like Yoda would want) in waiting for their arrival. They also gave me a really cool Yoda card too. I also got a super fancy wallet, which was really thoughtful. It smells all new and leathery and I’m still trying to figure out just how a wallet works. Apparently it’s not meant to be kept in a front pocket, but wouldn’t that mean that I have to sit on it? Wouldn’t that feel weird? Either way I’m going to try and convert over to using a wallet and will have to see how that goes. The wallet also came with a little monkey who’s currently hanging out on the shifter in my car. My department got me some really funny gifts. A card that they modified and added so many great inside joke signatures to. They even found some long lost haiku that were written about me! Very clever guys, I’m still impressed. They were authentically wrinkled as well with stick drawings. I also was lucky enough to get a custom Nomenclature t-shirt as well. It’s very cool, and I will be most very proud to wear it. The cake they treated me to was super yummy and delicious. I’m not sure what exact kind it was, but was certain that it was good. Then my parent got me a cake and made me dinner, which was good. Honestly I was too filled from a weeks worth of treats to eat much. The cake was a carrot cake from Bake Works, they’re the finest cake in the land. My mom got me some clothes which was good. I kinda was due for some new stuff, and since she had the person working in the store pick everything out I will probably wear the stuff. My older brother got me a assortment of stuff too. A Link wall decal, a wiffle ball bat, a growing unicorn, and a DVD of some cartoons. I even also got some ninja star tacks for my office walls. All that and my phone buzzing all day with birthday texts and facebook postings/comments made for a very excellent birthday. Thanks so much to all!